σ is the Stefan-Boltzmann constant, equal to 1.82849716 x 10-23 M Days-3 K-4. So now we have all we need in hand to calculate a star's luminosity class - except! 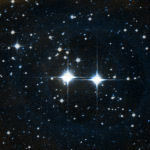 Looking at the above calculation begs the question, what is the star's radius? All the above works great if we have a star's radius to begin with but as only some hundreds of star's have had a direct measurement made of their radii the above seems to be rather acemdemic. Not so, as we are able to measure the luminosity of a star via other means - spectroscopic comparison - and through this we can actually use the above equation to determine the radius of the star, thus having in hand the information required to make our calculations (also see: Spectroscopy of Variable Stars for more on calculating a star's absolute luminosity and density via this method). The above image of star HD 66171 is from the Palomar Observatory Sky Survey (POSSII) and was obtained via the Aladin previewer utility. The below are sites with material and information regarding this section's topic of Stars, Specturm, Luminosity and more. Hydorgen Emission Lines and Spectral Color Both pages are from Georgia State University and are solid study reference of the science of spectral analysis - pages contain advance math and formulas. SBIG's new Deep Space Spectrograph Though this is a retail site for amateur astronomers, it provides a very good overview of the technical and working details of Spectrograph equipment. Australia Telescope Outreach and Education website Luminosity of Stars The Australia Telescope is operated as a National Facility under guidelines originally established by the Australian Science and Technology Council. 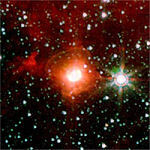 The Spectral Types of Stars by Alan M. MacRobert, Sky & Telescope Article regarding star spectra.